From PEN America Literary Award-winning author Michelle Tea comes a moving personal essay collection about the trials and triumphs of shedding your vices in order to find yourself. As an aspiring young writer in San Francisco, Michelle Tea lived in a scuzzy communal house: she drank; she smoked; she snorted anything she got her hands on; she toiled for the minimum wage; she dated men and women, and sometimes both at once. But between hangovers and dead-end jobs, she scrawled in notebooks and organized dive bar poetry readings, working to make her literary dreams a reality. 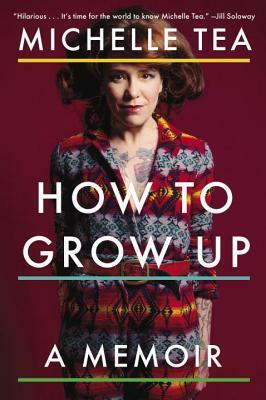 In How to Grow Up, Tea shares her awkward stumble towards the life of a Bona Fide Grown-Up: healthy, responsible, self-aware, and stable. She writes about passion, about her fraught relationship with money, about adoring Barney’s while shopping at thrift stores, about breakups and the fertile ground between relationships, about roommates and rent, and about being superstitious (“why not, it imbues this harsh world of ours with a bit of magic”). At once heartwarming and darkly comic, How to Grow Up proves that the road less traveled may be a difficult one, but if you embrace life’s uncertainty and dust yourself off after every screw up, slowly but surely, you just might make it to adulthood. Michelle Tea is a PEN America Literary Award-winning author. She is the creator and editor of Mutha Magazine, and founder and Artistic Director of RADAR Productions, a literary organization that produces monthly reading series, the international Sister Spit performance tour, the Sister Spit Books imprint on City Lights, and other events. She lives in San Francisco with her partner Dashiell and their dog, Charlie.